Jose Mourinho has finally revealed the reason behind Eric Bailly’s consistent exclusion from the starting lineups. The Ivory Coast international appears to have been completely frozen out by the Manchester United boss, having only started the first two games of his side’s ongoing Premier League season, against Leicester City and Brighton. He has since been left on the bench or out of the match-day squad entirely on most occasions, with the pairing of Chris Smalling and Victor Lindelof being Mourinho’s preferred choice in central defence. 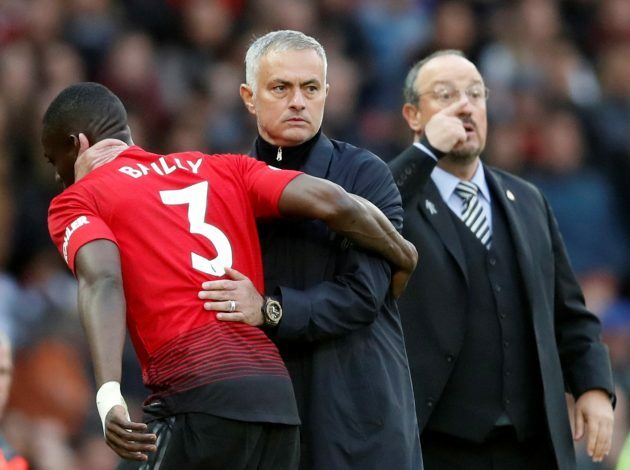 Now, amid several sources linking Bailly with a January departure, Jose has finally revealed the reason behind Bailly’s descent down the pecking order. “I think Smalling and Lindelof are playing much better than the beginning of the season,” said Mourinho. “I decided to give Victor the opportunity of his evolution. “Evolution with some mistakes, yes, because he is young, especially young in the Premier League. We decided to give him this continuity which I think it is clear it has improved him. “Bailly has physical qualities, he is very fast [but] he is not very tall. We thought that Chris Smalling would give some balance in relation to the qualities. Chris is very good in the air. He is tall and dominant in the air. Victor, in the building up, is better than Chris. Bailly stands a little over 6’1” tall, which is just below the average height for a Premier League centre-back. Smalling, meanwhile, is two whole inches taller than the African. Further, Mourinho seems to have already decided to exclude Bailly from the matchday squad for the upcoming league encounter against Crystal Palace. However, the 24-year-old may end up starting the subsequent Champions League fixture against Young Boys. “We have Phil, [Marcos] Rojo and Eric and I try to make them motivated,” Mourinho said. “To make them motivated – I cannot select the same all the time,” the United gaffer added.